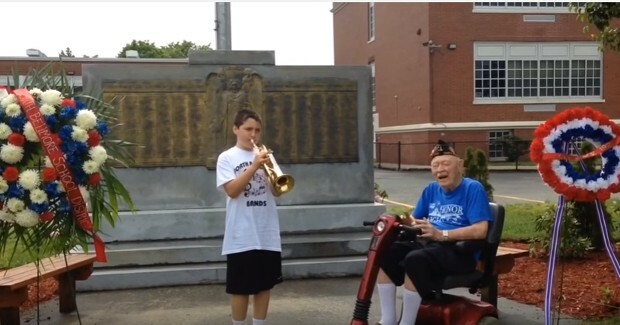 After a Memorial Day parade was cancelled in Bellmore, New York, a World War II veteran was treated to his own personal show. Unaware that the parade had been cancelled, WWII vet Chris Iannacone showed up expecting to be treated to marching bands and a Memorial Day tribute. However, due to poor weather the parade had been cancelled. Luckily, 11-year-old Nicholas DeGregorio also did not receive the memo that the parade was cancelled. DeGregorio, who was supposed to play in one of the marching bands, decided to hold his own parade and play his trumpet out of the window of his car while his family drove the parade route. When the DeGregorio family reached the end of the route, they stumbled upon Iannacone who was paying his respects at the veterans memorial in Bellmore. Iannacone’s daughter shared with the DeGregorio family that her father was upset and disappointed that the parade had been cancelled. DeGregorio then decided to give Iannacone his own personal show and played his own rendition of “You’re a Grand Old Flag” for the veteran. Iannacone smiled ear to ear and was super happy to have his own personal Memorial Day tribute. Check out the heartwarming video below. BUZZFLURRY.COM-Your blog to get the latest trending viral news and information.